You need good glasses to drink beer. It was a good job that I’d left mine in my room when I bought this one. If I had been able to read the label, I would have noticed that this intriguing looking beer was in fact a ‘Witbier’ or white beer and I’d never have chosen it. Well, that would have been my loss because this is not you average white beer. Not exactly white, it has the colour of a battered cod fillet (see above), this rather spicy brew had enough citrus tang to cut through the grease and go perfectly with fish and chips. 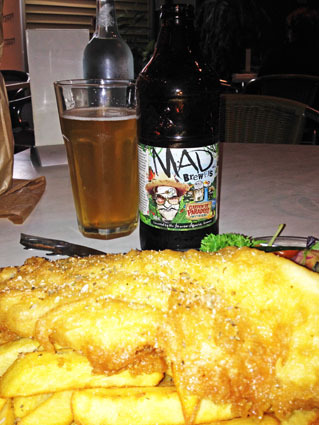 A little research reveals that the Mad Brewers are an offshoot of James Squire. This experimental brew is laced with a special ingredient, the “grain of paradise’ , a close relation of cardamom. It’s this grain that gives this witbier it’s x-factor ………. go mad for it! And you know you’re going to fall – Grace Slick, Jefferson Airplane. 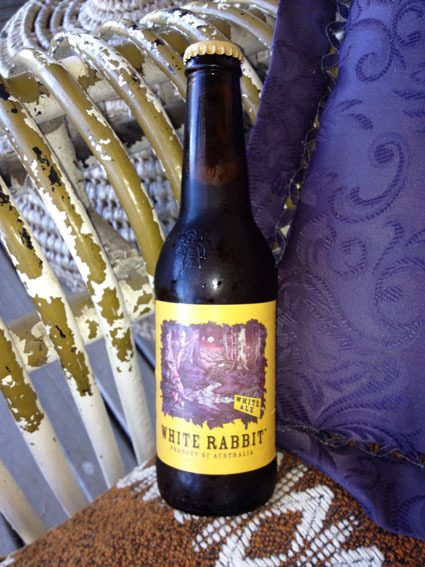 Another intriguing brew, White Rabbit’s White Ale is a Belgian-style wheat beer in the mould of the better-known Hoegaarden, a past favourite of mine …. when it was trendy. I always remember Hoegaarden tasting of bananas and coriander, this White Ale is altogether different. Perhaps this would be better on draught. Sure it’s white and it’s ale Jim, but not as we know it. It was a little too sour for my liking, recalling undiluted lemon barley water or even palm wine. I won’t be rushing to buy another White Rabbit but it’s interesting enough to get me to try the Dark Ale at a later date. Feed your head …… check out the White Rabbit website and learn about the brewing process. Find out about Jefferson airplane here …….